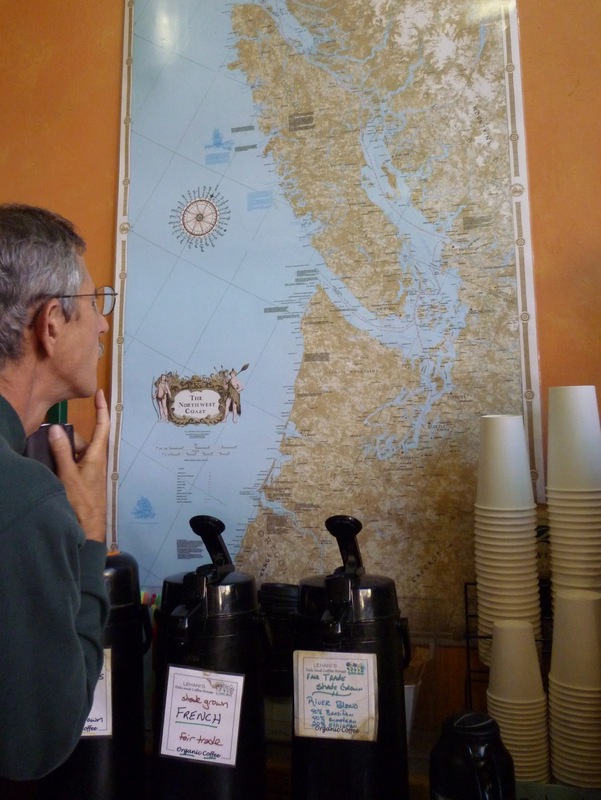 My dear husband conceived the idea of going to the state of Washington for a week, to visit the Olympic Peninsula as he had done with his parents as a boy, and also to see some friends and family who had moved there since our last visit. I’m always a bit overwhelmed by the water, water everywhere aspect of that area, and not because of the water itself. It’s just that the many canals, sounds and straits around Seattle and northward to the Canadian border make me even more likely than is my usual disorientable self to lose track of where we are. I have studied the maps more than most people are accustomed to doing in this day of GPS and cell phones, but I still feel pretty hopeless about it. We are always looking across some body of water or other, and I never know what it is or what I am seeing on the other side. 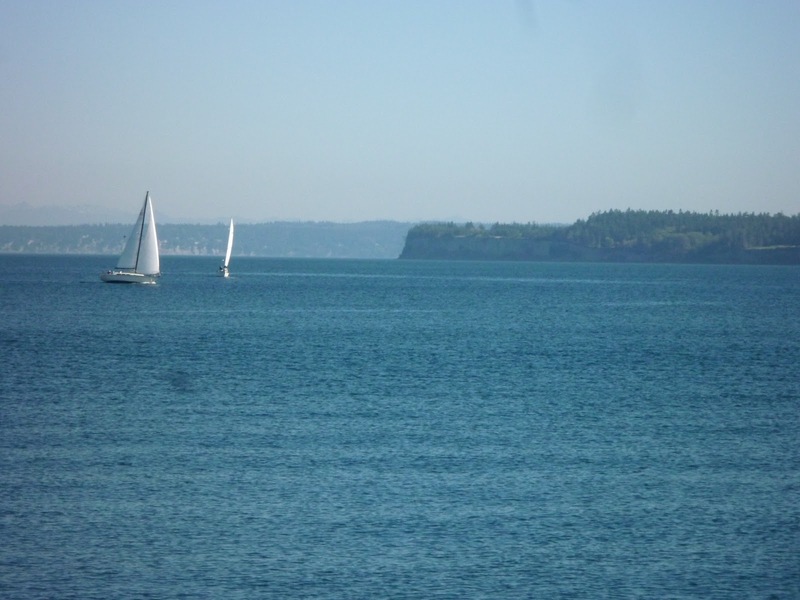 It’s beautiful, all that water, and so refreshing, as long as I don’t let myself get discouraged when Mr. Glad wants me to know that those are the San Juan Islands, or that is the Hood Canal. But being overwhelmed by water might be a good thing, if one isn’t drowning. I kept thinking of my church’s teaching that water is the substance representative of all Creation, so that when Christ was baptized in the Jordan he was actually baptizing the Creation and blessing it. 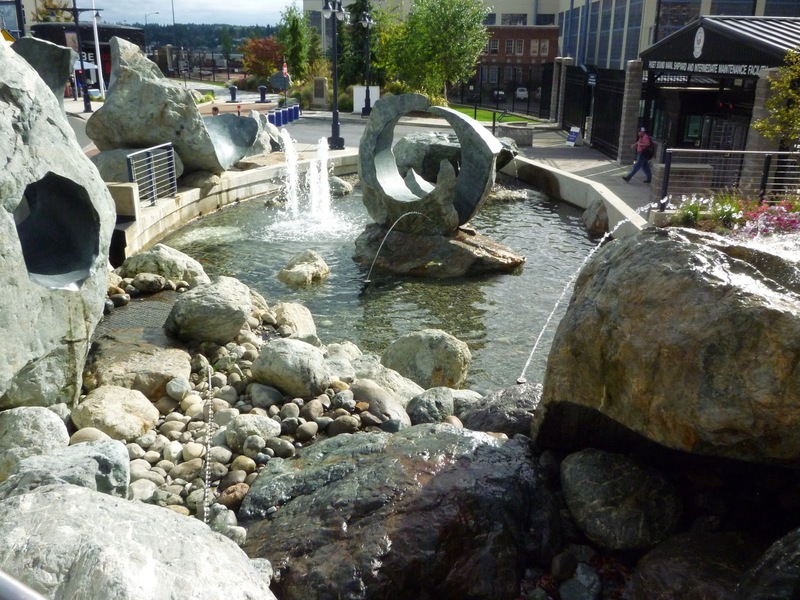 In Bremerton the Harborside Fountain Park highlights the city’s maritime and shipbuilding history with a multitude of fountains, surrounded by constant views of waves, and boats sailing across…um, which canal is that? Spray from fountains was blessing me, and the waves and moist air were full of the kindness of Him Who alone is holy and blessed in Himself. I can’t intellectually comprehend what my Father has done any more than I can find my way around Puget Sound, but I can receive the blessing anyway. The forest is imposing wherever the water is not. Lush conifers for Christmas trees, tall, tall Douglas firs and spruces for telephone poles and lumber, lots of lumber for all our houses. This western part of the state is known for high and frequent precipitation to keep all these trees happy, though when the sun doesn’t shine for days, some humans get SAD (Seasonal Affective Disorder) apparently for lack of sunlight, especially in winter when the days are also shorter. Amazingly, we didn’t have to worry about that, because aside from some morning fog and clouds, and the slightest drizzle, the weather was favoring our touring of the area and taking pictures. I never pulled my rain jacket out of its pouch, even in the rain forest! Spending days in this part of the country brought to my mind images from a National Geographic children’s book, Three Little Indians, which we read many, many times to our children in the 70’s and 80’s. 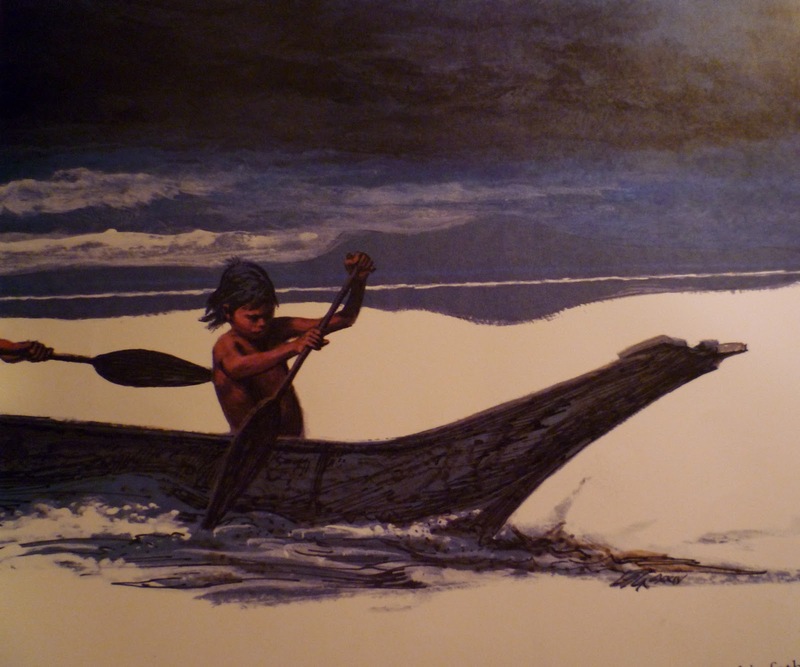 One of the children featured in the stories of three Native American tribes was Center-of-the-Sky, a Nootka of past eras of the Northwest. 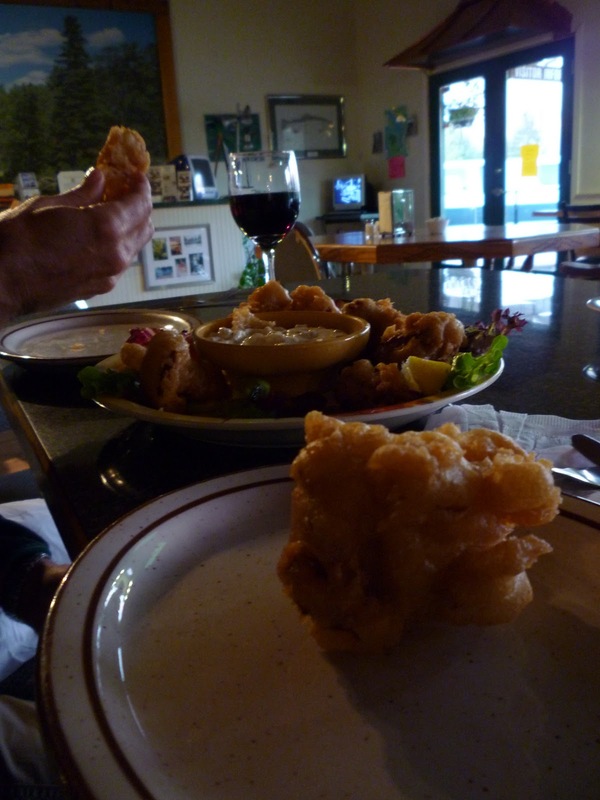 The dark skies and high surf of the paintings, along with the idea of fish as a staple of the diet, came back to me on our trip, when two of our hosts served us salmon, which might be the quintessential food of the Northwest. 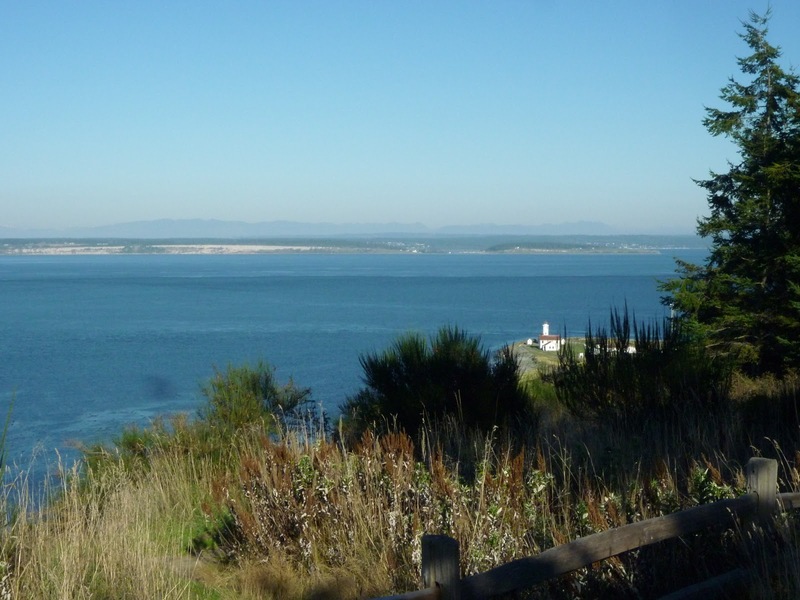 Years ago when I read a story of Lewis & Clark to the children I was saddened to hear that when the party of mostly Midwesterners got to the Pacific Ocean, hungry and weary, they found a plenitude of fish, but didn’t like it. [I later learned that this is not true.] 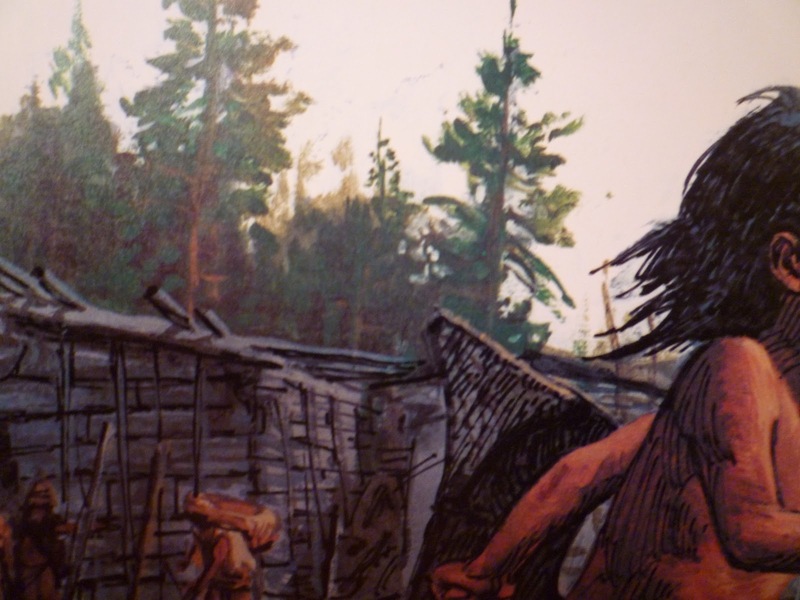 They had to trade with the Indians for some kind of meat they were more accustomed to. I suppose they were o.k. with berries, those dear little fruits that abound here. B.’s cousin Anne told us that in her neighborhood in Shelton the women will go berry-picking together to make the time pass more quickly as they tediously fill their buckets with tiny huckleberries or blueberries for pies or the jam pot. Mushrooms are prolific in Washington’s woodlands; they get nutrients from the tree roots. October is a good time for harvesting the ones called chanterelles, and one humble café where we ate was featuring wild chanterelles deep-fried. I didn’t want to miss the chance to try these exotic fungi, so we ordered a plate of appetizers. After downing the lot, we doubted that was the best way to present their subtle flavor. Too many trees!? How could one find fault with that? Western Washington seems to be almost the opposite of the desert, the symbol of want and dryness. But creatures are provided for even in that arid place, and I might still prefer it, with its abundance of sky and sun shining out of it. For the remainder of our vacation, though, I found plenty in this wet and wild land to nourish my soul as well as body. Traveling with you is once again unique…thank you for sharing this part of your journey…the inner musings are precious. That first photo with the map is lovely…and all the water, splashing and misting on you, thinking of our Lord's baptism…very serene. I would love to visit Washington one of these days. What a large and beautiful world we live in. I like the map picture, too. That is a lot of water. Oh! That's my land! I love it so. Thank you for this post- washington State is where we intend to go, if we ever get across the Atlantic with these suns of ours. PC spent a blissful holiday walking and visting in and around Seattle in a former life, and we've wanted to go together ever since. And your post comes on the same day as Jo asked if we could go to America one day- although he wants South America to see Paradise Falls. Too much viewing of Up, methinks! Oh, so beautiful. I am glad you go to so many lovely places and post your photographs. I love the expanse of blue – it makes my heart lighter just to see it in a picture and imagine being there. The water looks beautiful to me, but I can see how easy it would be to be confused about where you are. Few landmarks in the water. Thank you for sharing your vacation with us.